A Norwegian court is set to look into the state's appeal against a ruling that mass murderer Anders Breivik was treated inhumanely in prison. Breivik killed a total of 77 people almost six years ago. “We hope that the state wins this new round, that justice digs deeper into the case,” the head of a family support group, Lisbeth Kristine Royneland, told AFP. 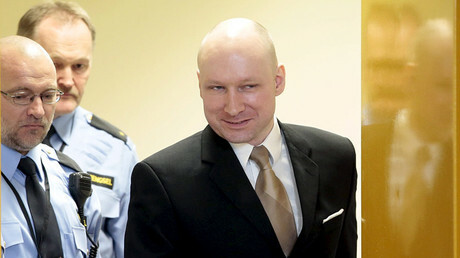 Back in April, a lower court's ruling found that Breivik was experiencing “inhumane” and “degrading” treatment behind bars, despite living in a 30-square-meter, three-cell complex: one for sleeping, another for studying, and a third for physical exercise. He is allowed to play video games, use gym machines, read books and newspapers, and has a computer without Internet access. The district court judge, however, found that Breivik had been isolated from other prisoners and did not have enough social activities. Also, the ruling mentioned “humiliating” strip searches, regular use of handcuffs, and the fact that Breivik was often woken up at night. During the hearings in April, Breivik complained about cold coffee and frozen microwave dinners in prison, as well as the use of plastic cups and plates. On July 22, 2011, Breivik first murdered eight people by detonating an explosive device near a government building in Oslo. Afterwards, dressed as a policeman, he massacred 69 others, mostly teenagers, shooting them at a Labour Party youth camp on the island of Utoya. Just over a year after the attacks, he was sentenced to 21 years behind bars.